So far Višnja Marković has created 4 blog entries. 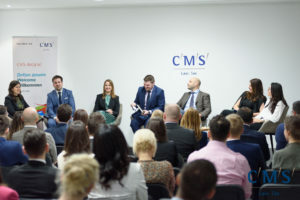 Attorney at law from our law office, Sara Pendjer was one of the moderators at the round table that took place on 6 April 2019 in Belgrade. 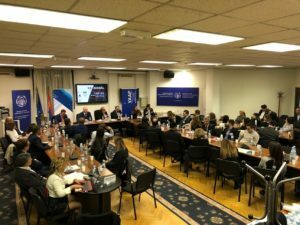 Round table was organized by ICC Young Arbitrators Forum and Under 40 Section of Serbian Arbitration Association in the premises of CMS Belgrade as part of the Belgrade Arbitration days (Belgrade Arbitration Conference and Belgrade open pre moot in preparation for the Vienna Willem C. Vis Moot. The venue was organized in a fresh debate form under the topic Debating hot topics in International Arbitration. The first panel discussing the topic of Transparency vs. confidentiality was moderated by Florian Ettmayer (Junior Associate Baker McKenzie Vienna) while Ivana Blagojević (Deputy Counsel ICC International Court of Arbitration) and Marija Sćekić (Senior Associate WilmerHale London) offered their opposing view on the issue. The second panel dealing with question whether third party funding and security for costs shall be mandatory or exceptional was moderated by Sara Pendjer (being also co-chair of Under 40 Section of Serbian Arbitration Association) with inputs from panelist Giulio Palermo (Partner Archipel Geneva) and Alina Tugearu (Partner Zamfirescu Racoti & Partners Bucharest). The conference was opened by Nenad Kovačević (Attorney at Law CMS Belgrade and Co-Chair of Under 40 Section of Serbian Arbitration Association) who also gave concluding remarks at the end of the conference. Judging from the number or present guests and the reaction to this concise and efficient debate format, the audience was enjoying the discussion. On 7th November, attorney at law from our law office, Sara Pendjer, participated at the round table organized by the University of Belgrade, Faculty of Law along with Vienna International Arbitral Centre (VIAC), Belgrade Arbitration Center, Young Austrian Arbitration Practitioners (YAAP) and Under 40 Section of Serbian Arbitration Association. • Location and moderate travel expenses. Opening statement was given by Mr. Günther Horvath (president of VIAC) and Prof. Maja Stanivuković (president of BAC) while the discussion was moderated by Milan Lazić of Karanović & Partners and Filip Boras of Baker McKenzie Vienna and YAAP. Round table consisted of three panels, led by an Austrian and a Serbian lawyer (Philipp Peters of Konrad & Partners, Dragan Psodorov of Joksović Stojanović & Partners, Natascha Tunkel of KNOETZL and Jovan Nikčević of Baklaja Igrić Tintor). Sara Pendjer being also co – chair of Under 40 Section of Serbian Arbitration Association was on the panel along with Mr. Helmut Ortner (Counsel in WilmerHale London office) which dealt with Innovative ideas to make Regionally Handled Arbitration more attractive. Closing remarks were made by KNOETZL Partner Patrizia Netal and Assis. Prof. Milena Đorđević of the Arbitration Association. We are proud to announce that Ljiljana Urzikic Stankovic was the speaker on the Data Protection Seminar organized by Japanese Business Alliance in Serbia – JBAS and Canadian Serbian Business Association – CANSEE in cooperation with member NST Law Office on the January 29, 2019.